Demolition 2 accepted into the National Original Print show. 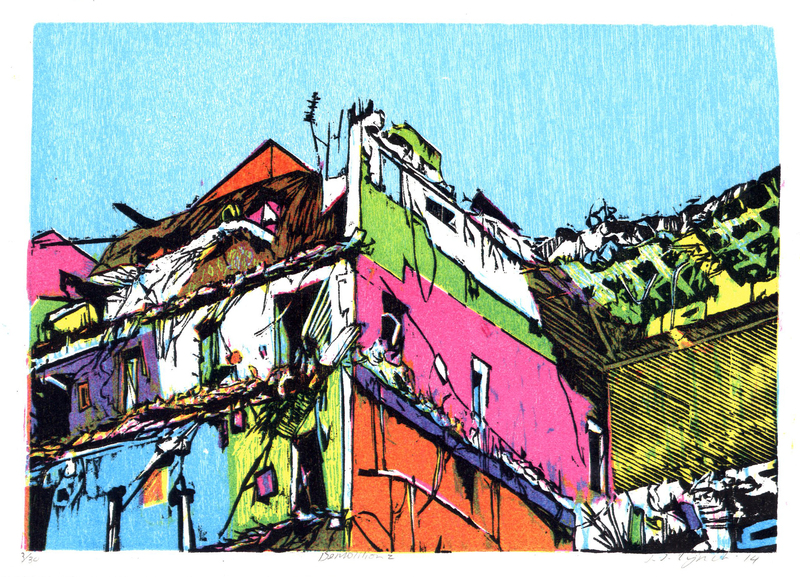 My miniature woodcut, Demolition 2 has been accepted into the National Original Print show at the Bankside Gallery, (next to the Tate Modern) The show is organised by the Royal society for Painter-Printmakers and highlights a vast array of contemporary printmaking artists across the country, Should be a great show and it opens on the 16th September 2014. Find out more on their website. I’m Extremely happy to blog post this time as yesterday evening I received a telephone call from the Royal Birmingham Society of the Arts of which I have two diptychs on display for the print biennial. The Phone call was from the curator of the exhibition and he cut straight to the point that Nancy Campbell (Editor of Printmaking today) has chosen My two piece Royal Mail:V2 to be awarded top prize for the Print Biennial. Naturally I’m extremely honoured and delighted about this and when asked if I would be attending the award ceremony I was already booking the B&B for a little holiday in Birmingham. If you are in Birmingham do pop down to see the print Biennial and also from the RBSA there is a sculpture trail going on. More info at this Link RBSA Print Biennial.